As the weather gets cooler and the streets of Queen Anne begin to turn gold from the myriad of fallen leaves, we start looking for items in our closets that provide comfort when venturing outdoors. Something soft to wrap yourself into when the wind picks up, something that will keep you cozy both out walking and inside the office. This week we have gotten a number of beautiful items in stock to celebrate Fall and we can’t wait to share them with you! Our Dreamers sweaters are back, and in five new colors to boot! Come check out the Plum, Red Rust, Coffee, Ginger and Olive. These bestselling sweaters are beloved for a reason - stylish yet supremely comfortable they are easy to dress up or down depending on your preference. We have so many jeans, booties and crossbody purses to pair with them - feel free to ask us to style anything for you while you are shopping. We’d love to do that for you! Among the new items we received this week were these cozy plaid vests. We have them in the cream as pictured above as well as a navy. Mustard, rust, plum and olive are popular colors this Fall. They are great for adding a pop of color to your wardrobe without having to go over the top. 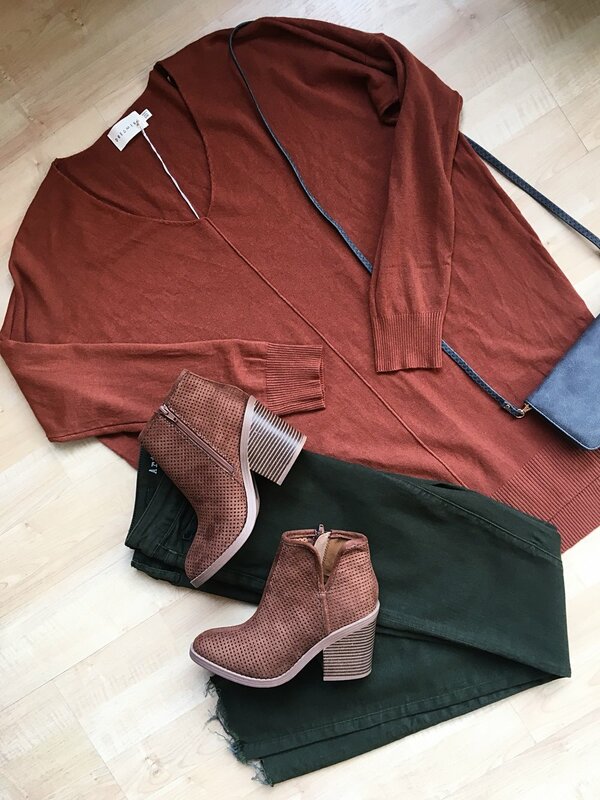 Even if your closet is mostly neutrals, grays or blacks, adding a rust cardigan sweater or a mustard top could spice up a simple outfit while making you feel like a million dollars. And for those of us who love the cozy and casual style, take a peek at the outfit above. Our leggins (they are one size fits all) are slightly thicker and are simply perfect for the weather. Add a gray long sweater, a forest green cowl scarf and a comfy shoe and you are all set to walk to Macrina on a Sunday morning. New Gilli dresses, Dreamers sweater and lots more for you to see! We have so much more for you to see than we can fit in one blog post. We are very excited for Fall, for beautiful and comfortable clothing and for seeing all of you in our friendly neighborhood boutique! Please also note that this Sunday we will be closed for a bit of reorganizing and adding a few new features to the store. We will share some before and afters next week! See you soon at Meadow!